Yerbury’s collection of over 3,000 negatives of architectural photography was given to the AA Photo Library in 1948 where they remain, and are the most valuable in its historical archives. Generally known as F.R. Yerbury rather than Frank, he held the influential post of Secretary of the AA, its general administrator, from 1912 to 1932. He must have been a fascinating character- at that very conservative time he reached this high position having no connections and no education, having left school at the age of 13. He also seems to have had boundless energy- as well as the AA, where his role placed him at the centre of its activities and, incidentally, he originated its move to Bedford Square, he ran the Building Centre which he founded. 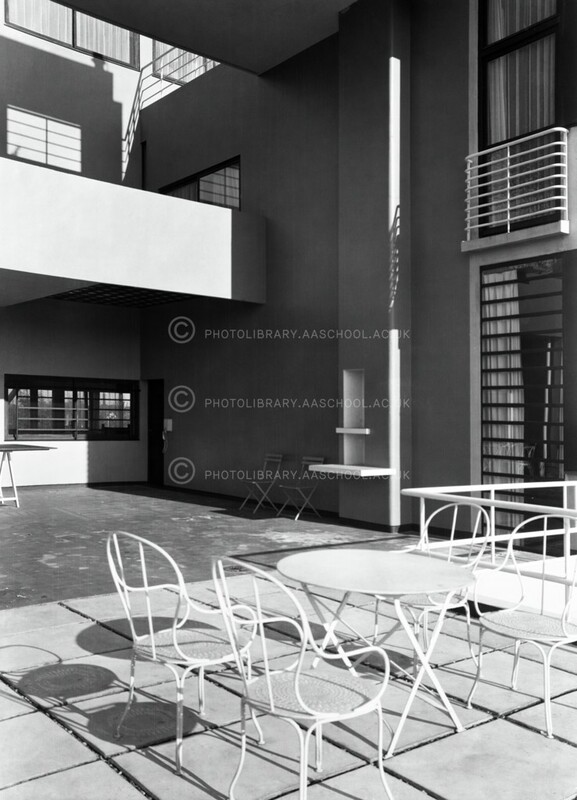 His parallel career as an architectural photographer was extensive, publishing 12 books of his photographs and an astonishing 200 journal articles. Working mainly between 1923 and 1933, the years of the formation and early realisation of architectural modernism, his photography provided rich imagery that suggested many different possibilities for the architecture of the period. Yerbury’s accounts were in many cases the first to be published in English of modern buildings now seen as canonical. Long before Hitchcock, Giedion, Pevsner and the other writers who effectively invented the Modern Movement, Yerbury brought the work of what are now seen as the ‘masters’ of modernism to the attention of the English-speaking world. Yerbury’s self-appointed mission comes out of curiosity to search out new architecture and document it: his research took him to almost every country of Europe, revolutionary Russia and the U.S.A., photographing any building that was new, not just those we now may see as historically important, as well as many compelling pictures of older architecture which are also of great value. His photographs of Le Corbusier’s work are the first published in Britain of some of the architect’s most important early work. 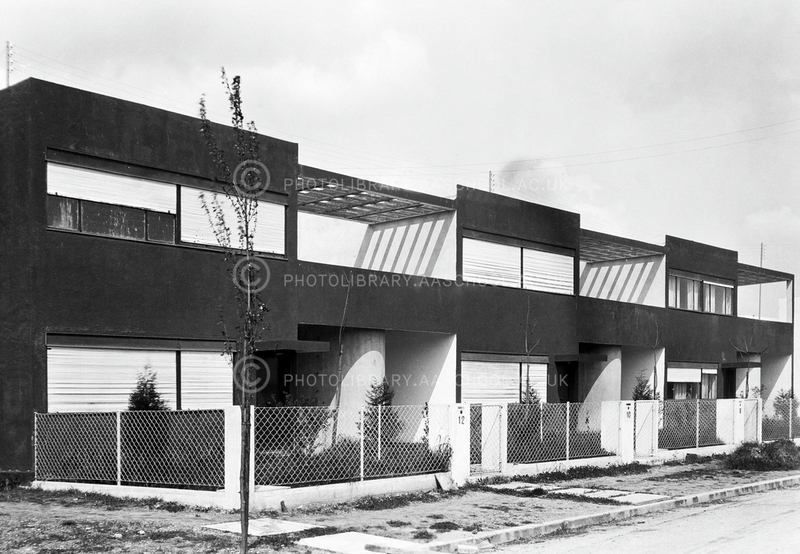 The double house Maisons le Roche-Jeanneret in the suburbs of Paris was completed in 1925 and photographed by Yerbury in the following year. The spectacular interior of Raoul La Roche’s studio is photographed with his collection of paintings by Braque, Picasso, Leger and many others. 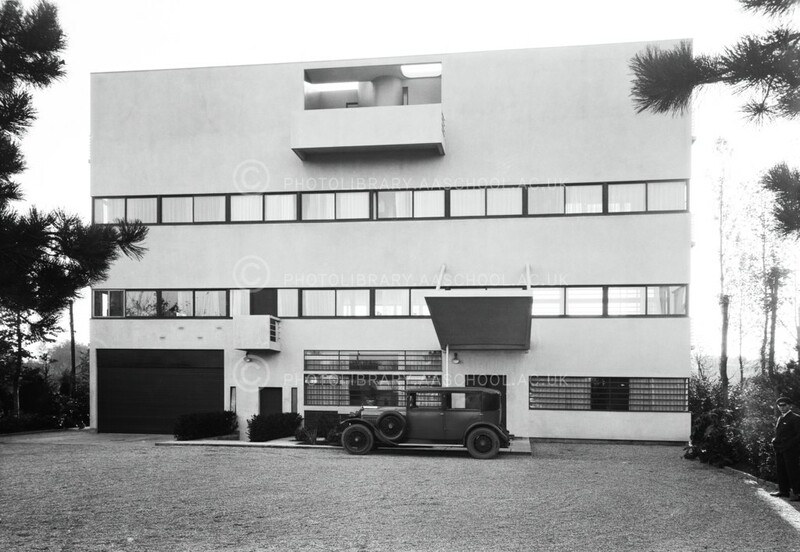 The house at Garches, completed in 1928 and probably the richest and most complex of Le Corbusier’s Purist work, was photographed in 1929. 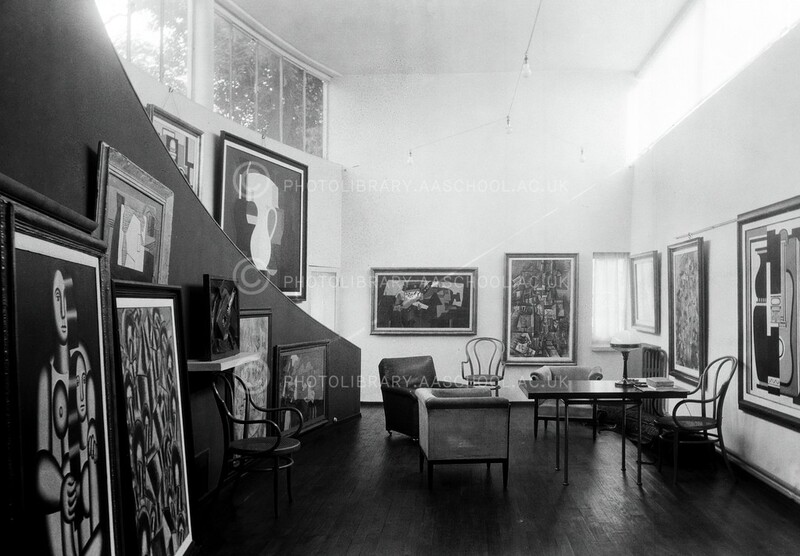 The most-published of the whole of the AA’s Yerbury collection is the image of the entrance front with its now-antique car and façade that still looks modern: the interior spaces, opening on to a series of terraces facing the garden were unprecedented, but still provide an evocative model for house interiors. At Pessac in south western France, Le Corbusier built one of his earliest attempts at modernist social housing for the industrialist Fruges: altered afterwards by its residents who perhaps found their modern qualities too hard to take, Yerbury’s photographs were taken soon after its completion in 1926.